Running from Moscow in the west to Vladivostok and Beijing in the east, the Trans-Siberian is the world's most famous railway. It also offers an economical and pleasant way to get to Mongolia. The train takes takes 28 hours to get to Ulan Bator from Beijing, a pleasant overnight journey, or 4.5 days from Moscow. 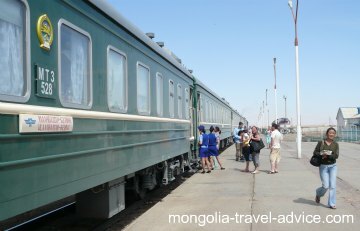 The passenger trains pass through a number of interesting places, but they only pause for a few minutes at most stops, so travelers should plan to take multiple trains to allow for decent stopovers -particularly in Mongolia! All aboard! Passengers ushered back on the train after a brief stopover. The Trans-Siberian train takes a number of routes. In the West, the Trans-Siberian starts in Moscow, but many travelers begin their train journey in wonderful St Petersburg. Heading east, the Trans-Siberian passes through Irkutsk, a Siberian city on the Angara River. Many tourists choose to stop off in Irkutsk to explore the Lake Baikal area -Siberian wilderness in all its magic. After Irkutsk the trans-siberian railway continues east to Ulan Ude, the Russian homeland of the Buryat people, which lies about 600km (372mi) north of Ulan Bator. From Ulan Ude, the main line of the Trans-Siberian continues east all the way to Vladivostok on the east coast. At different points along this stretch of the Trans-Siberian, two routes split off the main line and head south to Beijing; one heads through Mongolia and the other bypasses it to the East. The Trans-Manchurian route heads off at Chita, skirting around the Mongolian border before heading south to Beijing from the Chinese city of Harbin. The Trans-Mongolian route turns south from Ulan Ude, and crosses right down through Mongolia before hitting China and heading towards Beijing. The Trans-Mongolian route enters Mongolia in the north at the town of Sukbataar. Between the northern border and Ulan Bator, the railway passes through densely forested mountains turning into the rolling green hills of popular imagination. South of Ulan Bator towards China, the grassy steppe quickly transforms into the flat, arid plains of the Gobi desert. These desolate Gobi landscapes are occassionally punctuated by the odd eagle, yurt, or forlorn Soviet-built towns, and are just as interesting in their own way. The train leaves Mongolia at the Southern border town of Zamyn-Ude /Erenhot (Mongolia/China) before continuing south to Beijing. The Trans-Siberian lines are plied with with more direct (& touristy) Trans-Siberian trains, as well as more local trains, which only do legs of the journey. 10 years ago, stories of theft and thuggery on the Trans-Siberian trains were quite common, but these days they're quite pleasant and safe to be on -probably a result of the train being far more expensive than it was in the past. I simply lock my cabin at night, and I use a small padlock to secure my valuables (camera, ipod, etc.) to the baggage rack -taking my money and passport with me when I wonder around the train. These trains have a restaurant car which you can head into at any time for a basic meal or a drink, and there's an interesting mix of people to get to know. If you're in a 4-bed cabin from Ulan Bator to China, you could end up with a Chinese businessman, a Mongolian student heading to school in China, and a German backpacker named Hans. Internationals are more excited by the journey and hang around the walkways between the cabins, so it's easy to meet other like-minded folk to socialize with, or you can just sit in your cabin with a book and entertain yourself. There's something very soothing about the feeling the motion of a train and watching the landscape go by -you can just sit and stare out the window for hours. The Trans-Siberian trains will stop briefly in a number of towns along the way, giving you a chance to alight for a few minutes and wonder up and down the platform before the staff (who won't be winning any medals for friendliness) usher you back on. You don't get a great look at many of these towns but, to be fair, the industrial villages created by Mao and Stalin don't have a huge amount to offer their own citizens -let alone the modern tourist. The two popular stops between Moscow and Beijing/Vladivostok are Irkutsk and Ulan Bator -and much of their attraction involves visiting the countryside outside the cities. I've said it before and I'll say it again, unless you're really keen on doing the whole Trans-Siberian as a trip in itself, plan some decent stop-overs. Many itineraries offered by Western tour companies, for example, offer 4 days in Irkutsk and 4 days in Ulan Bator -which means about two-thirds of your time will be spent stuck on the train. These 3-night stops will give you a taste of Siberia and Mongolia respectively, but you can't expect to really get to know these places (Mongolia's worth months of travel in itself!). Ask about longer stopovers if you're interested; or you can do a shorter leg of the journey and stay longer in one of the places you'd otherwise just be passing through. For the more adventurous, masochistic, or cost-conscious, you can take local trains all the way through. I haven't done this myself, but have met travelers who have. By all accounts it's a challenging but memorable journey. You'll need time and a lot of patience, as there will be countless stopovers, transfers and delays. Don't expect to meet many other tourists. You need to pack a lot of food for yourself, as you can end up in some Stalinist towns where there's nothing to eat, and where the locals are so poor that (believe it) money is useless. I met a guy who did it during winter 10 years ago, he'd been all over the world but said it was the hardest travel he'd ever done; he was constantly fending off pathetic thieves in forgotten Soviet towns, and almost starved! Apparently it's a lot easier these days. Well-to-do Mongolians and Chinese are increasingly being priced out of Trans-Siberian trains, so the local trains will become an increasingly viable option. 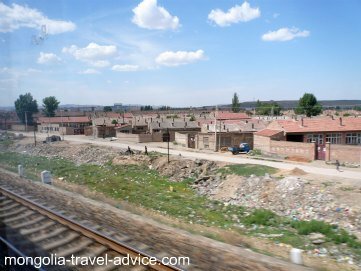 Quite a few travelers go from Beijing to Ulan Bator on local trains when the Trans-Siberian trains are sold out during summer, which is short and easy enough -you just have to transfer at the border, and possibly Hoh Hot in China as well. A faded sign reflects the dilapidation of the trans-siberian routes that took place after the fall of communism. But these days things are back on track. 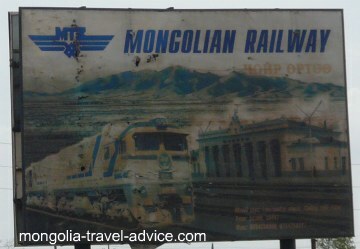 Buying trans-siberian train tickets to Mongolia in your home country will cost you more. The cheapest way to buy tickets is direct from travel agents located in Beijing or Moscow. I have never bought tickets from Moscow, because Beijing is cheaper and closer to Mongolia, but you can search online and find cheap tickets. For cheap Trans-siberian tickets from Beijing to Mongolia (and on to Moscow), I have used Ocean Travel a number of times over the past 4 years and highly recommend them. Roy and the team have an office in central Beijing. They sell cheap tickets on the Russian, Chinese, and Mongolian trains, and offer very good customer service. You can use the form below to request a quote from them. You can ask them for quotes on flights as well so you compare prices and consider traveling to Mongolia by train one way, and flying out the other. You're travelling through ex-Communist countries, so expect painfully long delays at every border. Crossings take 2-5 hours, depending on how thorough the officials are feeling at the time. The crossings often take place at night, so you can be tired and grumpy, but as with all bureaucrats it pays to be smiling and polite no matter what. Note that most trans-siberian trains have drop toilets, so the surly train staff will lock the toilets as you're pulling in to avoid unpleasant smells fouling the tracks at the stations. On a 3 hour stop, as you can imagine, this can become downright painful -particularly to those boisterous travelers who'd been having a great time laying into the beers for the evening. I've seen female travelers crying with pain, but this didn't evoke mercy from the train staff. Cut down on fluids and try to go to the toilet regularly if you're nearing a border, and alight from the train where possible. The Mongolia-Russia border is probably the worst, and you're more likely to be held up the full 5 hours due to the Russians. Just smile, and have all your documentation ready. 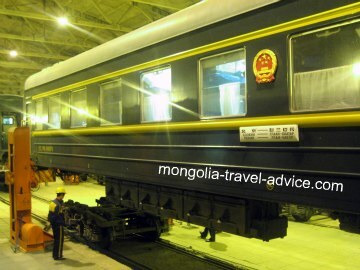 The China-Mongolian border typically hovers around 3 hours because they have to change the bogeys under your carriage (Sino and Soviet railway gauges are different). At the border, you will have the chance to alight before they change the bogeys (ask the staff when this is, don't expect anyone to tell you!). For those who stay on, the train backs into a shed to have each carriage jacked up while the bogeys are replaced underneath it. Travelers can no longer get out and watch, but you can see plenty from inside the carriages. It is an interesting process, but you won't have a toilet, so now i always alight and visit the platform's restaurant and toilets when i have the chance. You'd have to be stupid to smuggle anything illegal in your baggage across the border; don't take any bags or objects on behalf of anybody else. Note the Chinese guards often search through your luggage for such dangerous revolutionary material as Time Magazine or Lonely Planet China, which may be confiscated. Obviously, if they come across any contraband you'd be in serious trouble. Seated class: Only the local trains have seated class; it will obviously save you money but taking this for any length of time is highly uncomfortable. I've done this through parts of China before: by the time you've spent a night surrounded by locals playing loud video games and spitting nut shells onto the carriage floor, and see how the toilet cabin ends up looking like Jackson Pollock's been through there, you'll be lining up at the first-class ticketing booth for your next trip! Second Class (Hard sleeper): 4-bed cabins with a small table near the window. A shower is at the end of each carriage. Common with international backpackers, and perfectly comfortable for most. First Class (Soft Sleeper): cabins are 4-bed also, but beds are a bit more comfortable. More expensive, but not a huge improvement on second class. Deluxe Class: Two-bed cabins which offer much more comfort and privacy. Deluxe class on the Chinese trans-siberian trains is really roomy and even includes an in-cabin shower. Obviously better for well-heeled couples, but I'd think single women would find a 4-bed cabin more safe than sharing a 2-bed cabin with an unknown person. Replacing the bogeys under the train carriages at the China-Mongolia border. Mongolia uses the Russian rail gauge, which is only 3.5 inches wider than the Standard gauge used by China/Europe/USA. Books of course are essential. Many travelers have little laptops these days, so a few pirated DVDs and a pair of headphones couldn't hurt. Every carriage has a hot-water unit in it, which is very handy. So wherever you get aboard the train you should pack plenty of tea, instant coffee, two-minute noodles, instant soups.. anything that goes with hot water. I have about 4 packs of noodles a day on the train, which no doubt does wonders for my health. Biscuits, sweets, nuts, chocolates, snacks... the Trans-Siberian can be a good excuse to indulge. Alcohol is relatively expensive at the restaurant, so consider bringing your own. Liquor's probably best as it packs smaller and can be mixed with soft drinks bought at the restaurant. Beer will get warm, and is more likely to make you need the toilet right before they lock them on you at the border. Comfortable clothes are important -can't beat a pair of tracksuit pants. You should have something like pajamas so you can sleep dressed out of consideration for others in your cabin, as well as border guards -who can come in at any time of the night. From Mongolia to Russia: Trains leave from Ulan Bator to Irkutsk every evening. The number 5 heads to Moscow at midday on Tuesday and Friday. And the number 3 stops on the way from Beijing on Thursdays, but this can be difficult to get tickets for in Mongolia as it can fill up in Beijing. From Mongolia to China: Direct trains head to Beijing on Thursday and Sunday, but you can get local trains to the border on Mondays and Fridays, and continue from there. 28 hours. From Moscow to Ulan Bator: the Moscow-Beijing express leaves on Tuesdays; you can jump off this at Ulan Bator. Otherwise, train number 6 is the direct way; it leaves on Wednesdays and Thursdays. Expect this to take 5 and a half days. From Beijing to Ulan Bator: Trains leave on Tuesdays, Wednesdays, and Sundays. The journey takes 28 hours. Passing through another dull city in Northern China. Heaven knows how the poor inhabitants pass their day-to-day. There are tour companies in your home country that offer Trans-Siberian train tickets, but these are more expensive and often part of a larger, all-inclusive tour. Your best bet is to find a reliable tour operator in the city you're departing from. You'll need to pay a deposit to have the ticket issued, but you can simply pay the balance and collect the ticket once you arrive. Tickets from Beijing to Ulan Bator shouldn't be more than US $280 for a second class seat. Or Moscow to Beijing more than $400. If it is, your travel agent is taking a hefty margin on top. Have you been on the Trans-Siberian? Please share some tips for other visitors! Click on the button if you want to add any pictures! NB: Max 600x 800 pixels.